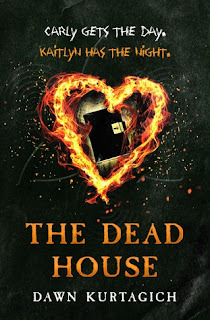 I cannot say how excited I am about kick starting the blog tour of this amazing debut by Dawn Kurtagich’s called The Dead House. I’m not someone who reaches for a horror book as my usual genre and I started this book with some trepidation. However, I can assure you tis book was amazing. More of this will be coming later in the review but now I must proceed and squeal how delighted I am to host this blog stop. Plus I was got a surprise for you at the end. Yes a Giveaway too. Before we go any further, let’s remind ourselves about what The Dead House is about. For, this audio blog tour, Dawn has prepared these fantastic audio teasers. I’ve been lucky enough to snag the teaser where the one of the main characters, Kaitlyn introduces herself. Listen on and I promise you will be screaming for more. Creeped out yet? Believe me when I say I jumped a few times while reading this book and yes, it was in bright daylight. I loved the format of this book, which is written in a unique format which I’ve never come across before, It was fascinating and I was hooked. Apart for my min review above, I have a copy of the final copy of The Dean House to giveaway. It is UK/IRE only and I’m not responsible for any items lost in the post. All you have to do is enter via the rafflecoptor widget below. I can't wait to read this book! I've heard so much about it! I've read a lot of horror - not all YA though. Most recently I read The Death House by Sarah Pinborough. Although she's a horror author this book wasn't overly horror-y (?! ), but it was amazing. Also a bit of Darran Shan, Michael Grant and I've got a Matt Whyman lined up to read too. I haven't read any YA horror, as I get genuinely scared by horror stories and movies. My imagination runs a bit wild! However, I've heard so much about this book that I want to try it out! I really enjoy this theme youve got going on on your internet site. What is the name of the theme by the way? I was thinking of using this style for the web site I am going to construct for my class project.Christ CHRIST Is definitely. I found your post by mistake when i was searching google for this issue, I have to say your site is in actuality helpful I also love the theme, its amazing!. I dont have that much time to read all your post at the moment but I have bookmarked it and also add your RSS feeds. I will be back in a day or two. thanks for a great post.Thanks for discussing the following wonderful subject matter on your website. I noticed it on the search engines. I am going to check back again when you post additional aricles. Bad habits: eating certain foods although noted that the cause of intolerance. Do not chew the food well. And do not bear the most common food are wheat and gluten (bread, pasta, pasta, pizza, cakes, cereals), alcohol, yeast (in cakes, cookies and beer) and manufactured dairy products (cheese, milk, butter). It is important to know what these foods can cause intolerance to be excluded from the diet.